Our ultra modern 2 bedroom family owned apartment at the Crown Towers Resort features, 2 bathrooms, 2 Ocean-View Balconies, FREE Wi-Fi and FREE parking as well as extensive facilities with many well-suited to keep the kids entertained. Deal directly with the owner and stay in this exact apartment which is featured in the photos. Sit back and relax while the kids take advantage of the numerous games on offer in the games room, or enjoy the lagoon-style pool with its own sandy beach, waterslide and pirate ship to climb about. Features include:- Spectacular, welcoming porte-cochere entry and foyer area and casual resort atmosphere, Mature tropical landscaped grounds and gardens, Reception open daily - 7.00am to 8.00pm, High speed lifts, Licensed restaurant with terrace overlooking the pool, Indoor water features, Tour desk and Tour lounge, Central Surfers Paradise location close to shops, restaurants, beach & nightlife, Undercover security car parking, Visitor and bus parking area, Internet Terminals available for guests in the lobby area. Recreation facilities include:- Brilliant lagoon with its own expansive beach and island, Separate Children's lagoon pool with pirate ship, waterslide and sandy beach, Heated 18m indoor pool, Fully equipped gymnasium & indoor spa, Saunas (male & female), Steam rooms (male & female). WE DO NOT ACCEPT SCHOOLIES BOOKINGS! Very Spacious Two Bedroom Apartment With Great Views and 2 Ocean-View Balconies. Second balcony faces the Surfers Paradise shopping area, towards Cavil Avenue. The master bedroom contains an ensuite with spa bath & large walk-in wardrobe. There is also a balcony with full ocean view from the master bedroom. The second bedroom contains 2 single beds. There is a main bathroom with toilet and shower. The apartment has a very spacious lounge with a 60inch LED TV with Foxtel and Blu-ray DVD players, a 40" LED TV in the master bedroom and 32" LED TV in the second bedroom, all are smart TV's with Blu-ray players and USB ready so you can watch your favourite shows and movies..
A large kitchen with fridge, oven etc. All utensils are supplied, the meals area includes a 6 seater dining table. There are two fold out sofas in the apartment which can accommodate extra guests. We have a Portacot, baby High Chair and full size Folding cot in our apartment too. Master bedroom, second bedroom and Main Lounge are all air-conditioned for your comfort. We also have ceiling fans in the two bedrooms. The world famous Surfers Paradise Beach is at your doorstep. Voted he most beautiful beach on the Gold Coast. Only 50m from the beach. All Theme parks are only 20 mins away - WARNER BROS. MOVIE WORLD, WET 'N' WILD Water World, SEA WORLD and DREAM WORLD & WHITE WATER WORLD. What would you like to eat? There are literally so many places it is really hard to decide. All restaurants are within walking distance. Located in the foyer of the Crown Towers Resort is the award winning Chiangmai Thai Restaurant. The V8 Super cars is one of the most exciting times on the Gold Coast. Fast cars and a sea of beautiful people. * Surfers Paradise's nightlife and its many restaurants. * Cavill mall within easy few minute walk. * Diagonally across from bus transit centre. * RSL and Bowls Club within 100 metres. * 1 block from Surfers Paradise Beach. * Walking distance to the Slingshot & Adrenaline Park. The heart of Surfers is at your doorstep, Cavill Ave, Nightlife, Dining and Shopping on the ground floor at this fantastic location Centrally located to Shopping, Restaurants, Transport, Parasailing, Jet skiing, Night Markets. Nightclubs and Elite Bars. Gold Coast Airport is only 25 km and 20mins by Taxi or 30mins by Bus. Very homely feel. Would be great to have some sort of info book. Thank you so much Emma-Jean! Hope to see you back soon. Amazing Apartment that has it all!! We had such a great stay at John’s apartment. The apartment is very spacious, bright, inviting, clean and well stocked with everything we needed. Walking distance to the shops and restaurants which made everything easier. The kids absolutely loved the view of the sling shot from their room and had a ball in the pool especially the pirate ship. Short driving distance to the theme parks added bonus!! 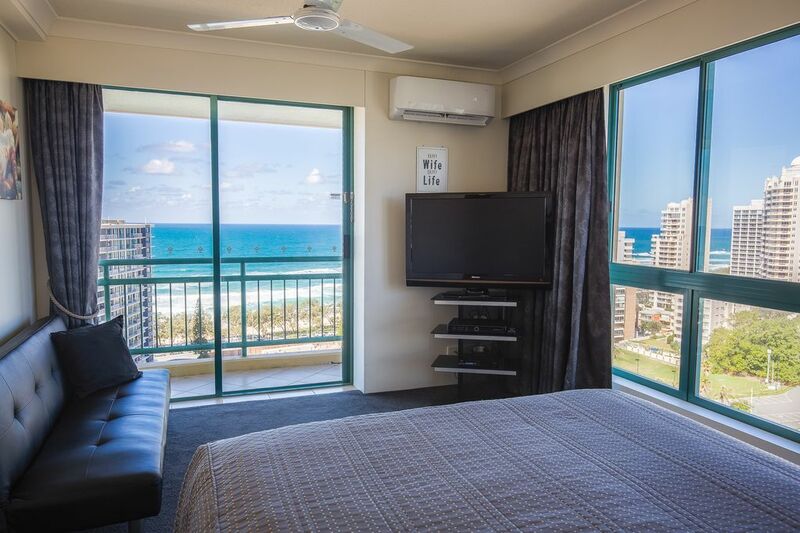 We wouldn’t hesitate to book John’s apartment again for our next family holiday to Gold Coast. We just spent seven glorious nights at the apartment. We loved it so much. Spacious, clean, fantastic facilities, close to everything with tram at door step. We will be back. Thanks John! Beautiful and comfortable from the moment you walk in the door. Hi Rob and Bec! Thank you for your wonderful Guest Review and for being such a delight to have as a guest! See you soon. You are most welcome Hiba! Please come back soon. Warmest regards! Very impressed from first stepping into the apartment how lovely and spacious the rooms were. My family of 2 adults, 2 kids thoroughly enjoyed our stay at your apartment. From the well equipped kitchen, to the numerous TV/Foxtel options, plus the high speed internet my son certainly loved! Perfectly located close to the heart of Surfers and just a stroll to the beach and just a short drive to the theme parks. Not to mention the complex has plenty of downstairs pool options (including indoor heated pool/spa for those cooler days). WOW! Thank you so much Amy for your lovely Guest Review and for being such a lovely guest. Please come back soon!